Julio Morban was named Southern League Hitter of the Week today. 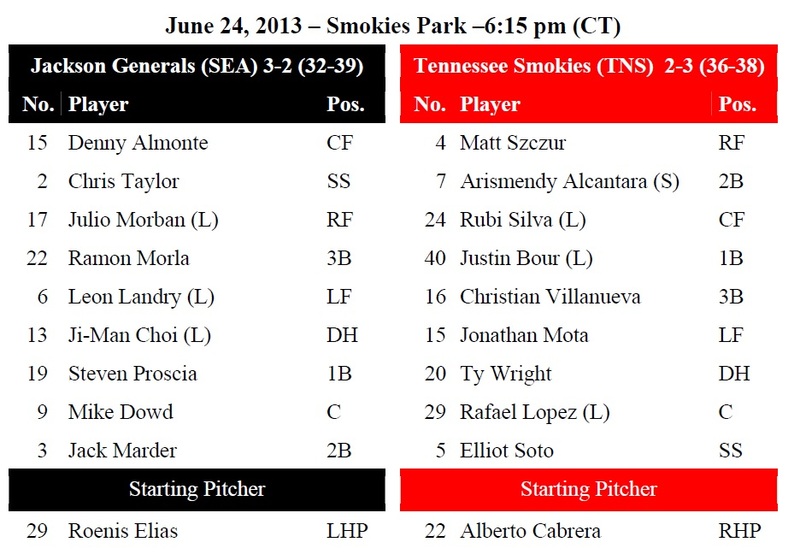 TODAY’S GAME: the Generals begin a road series tonight with game #1 of a 5-game series at Tennessee against the Smokies…this is the 11th of 20 meetings between the clubs (3-7) and 2nd series played at Smokies Park…24-year-old Roenis Elias makes his 14th start for the Generals and 2nd of the season vs. Tennessee. This is his 48th overall start in his pro career. Elias is 3-1 with a 1.88 ERA on the road as opposed to 0-5 with a 4.20 ERA at home. GENERALS RECAP: DH Steven Proscia hit 2 home runs and 3B Ramon Morla hit a grand slam home run as Jackson defeated Mobile 9-3 on Sunday evening. 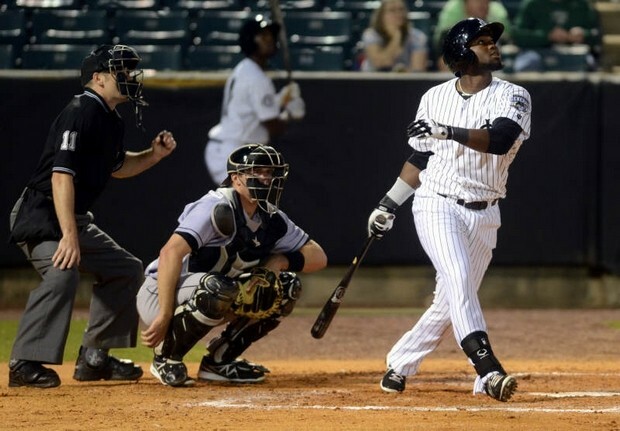 Proscia (3×4, 3 R, 2 HR, 4 RBI) recorded his 5th and 6th home runs of the season and first since May 7 at Huntsville. Morla hit his 12th home run of he season and 2nd since being promoted to Jackson, while tying his season-high with 4 RBI (also: 6/13/13 vs. Inland Empire w/High Desert). SS Gabriel Noriega (2×4, R) recorded the team’s only other multi-hit game. Starter Anthony Fernandez (5.0,6,2,2,2,4) earned his 4th win of the season, allowing 2 runs on 6 hits in 5.0 innings. RH Tyler Burgoon (2.0,3,1,1,1,1) allowed a run top of the 6th inning, while relievers Nick Hill (1.0,0,0,0,0,3) and Andrew Kittredge (1.0,0,0,0,0,0) combined to hold the BayBears scoreless over the final 2.0 innings. YOU ALREADY KNOW…that Steven Proscia recorded 2 home runs in yesterday’s 9-3 win over Mobile, but DID YOU KNOW?…that is was the 2nd straight day a General recorded a multi-home run game (Jones on Saturday) and it was his 7th multi-home run game of his career (last: 8/23/12 vs. Lake Elsinore w/High Desert). NEWS & NOTES: 29 of first 71 games have been 1-run games (10-19) which is the 2nd in all of minors…41 of 71 games have been decided by 2-or-fewer runs (13-28) and 6 have been extra-inning games (2-4)…In games decided by 3+ runs the Generals are 19-11. • ALUMNI REPORT: 2012 General C Mike Zunino (2×3) saw his first career multi-hit game yesterday in Seattle’s 6-3 10 inning win over Oakland. In 8 games Zunino has 6 hits in 28 at-bats (.214). • LEADING THE LEAGUE: OF Julio Morban leads the league with a .328 batting average and has hit safely in each of his last 5 games, batting .350 (7×20) with 6 runs scored, 3 doubles, 1 home run, 1 triple and 9 RBI. • MIGHTY MOUSE: SS Chris Taylor had a day off yesterday, but has hit safely in each of the 4 games he has appeared with Jackson, batting .286 (4×14) with 3 runs scored, 1 double and 1 RBI. • MR JONES…MR JONES: OF James Jones currently has a 5-game hitting streak, batting .421 (8×19) with 3 runs scored, 1 double, 2 home runs and 6 RBI. • NEW FRESH PRINCE OF TACOMA: RH Taijuan Walker was promoted to Tacoma Friday. He struck out a career-high 12 on Thursday against Mobile. In his last 5 starts, has struck out 39 and walked 5 in 32 2/3 innings, all while allowing opponents to hit just .191 (21-for-110). Hemade 39 starts for the Generals in 2 seasons complete with rates of 9.1 strikeouts and 3.4 walks per nine innings. • WE GOTCHA! !…Jackson catchers lead the SL catching 48.5% of base stealers (33 CS, 68 Att). The next closest is Mobile which is throwing out 32.1% of base runners.